A specialist in fun cruising. Discover the worlds with the fleet of Disney Cruise Line! Disney Cruise Line offers endless fun for cruisers young and old alike. The iconic cruise line’s four ships, Disney Magic, Disney Wonder, Disney Dream and Disney Fantasy are designed from the bow to the aft with imagination and love. Restaurants styled after beloved Disney movies turn every meal into an entertainment experience, and children will have plenty of opportunities to meet their favorite characters aboard the ship. Grown-up passengers will appreciate the level of comfort and style among these luxury ocean liners as well as the chance to relax and recharge at one of the adults-only areas while the kids are off having fun. With some of the friendliest staff of any cruise line, Disney’s trademark attention to detail completes the illusion that stepping onto their ships is stepping into a fantasy world. One of the perks of cruising with Disney Cruise Line is exclusive access to Castaway Cay, Disney’s own private island in the Caribbean Sea. From sparkling white sand beaches to water parks and character encounters, this one-of-a-kind port of call offers something for the whole family to enjoy. Cruise on board Disney Wonder and Disney Magic to incredible cruise destinations in the Caribbean, the Bahamas, Alaska and Europe. Experience the magic of Disney with a cruise on board the Disney Wonder. With incredible entertainment, fanastic on board dining options and fun activities, the whole family will enjoy the perfect cruise vacation. Experience the ultimate cruise vacation for the whole family on board the Disney Magic, where Disney truly comes alive. Launched in 2012, the Disney Fantasy is Disney's newest ship. Outfitted with innovative, family-friendly features such as live musical performances, kid-friendly dining, and a high-speed water slide, the Disney Fantasy is the perfect ship for an exciting family adventure. One of Disney's newer cruise ships, the Disney Dream is an elegant, family-friendly cruise ship embarking on short sails in the Caribbean. Grown-ups will revel in the art deco ambiance, adults-only pool and luxurious spa, while kids will have a blast meeting their favorite characters, playing in the water park, and riding the on-deck Aqua Duck "water coaster." Disney Cruise Line is the Florida-based, award-winning subsidiary of The Walt Disney Company. The company was incorporated in 1996 and ever since this impressive cruise line has remained one of the key players in the cruising industry through reinventing itself to suit the needs of its passengers, especially families. Every Disney cruise offers different kind of perfect for everyone in your family. You and your family can even visit Disney’s own private island paradise, Castaway Cay, where you will enjoy snorkeling, para-sailing, massages overlooking the ocean and just relaxing in a tropical paradise. There is no better choice for those traveling with kids. Become awe-struck by the charming magic of Disney Magic, Disney Cruise Line’s very own fairytale castle. 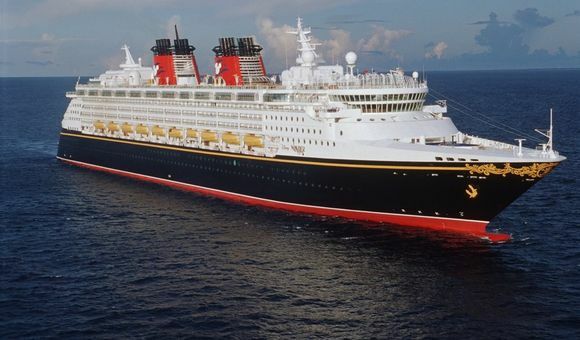 Disney Magic is a large vessel, carrying 2400 guests and 950 crew. Its sister ship Disney Wonder is a medium-size ship, holds 1754 passengers and sails from San Diego, California and Galveston, Texas. Activities abound these fun-filled ships: dedicated family nightclub with game shows, karaoke and family dance parties, first-run films in digital 3D, and relaxing treatments offered at Senses Spa & Salon. Take part in the most imaginative entertainment at sea! If you are impressed with life on board, you will be inspired by the Disney Cruise Line. With the cruise ships of this impressive cruise company, you can sail to wonderful destinations full of new discoveries, adventures and cultures. Many destinations in the Bahamas and the Caribbean, Europe, Alaska, Bermuda and the Panama Canal are waiting for you. Choose from a vast range of different routes at Dreamlines. Find your perfect trip with Disney Cruise Line and enjoy the excellent and competent service. Do you have any questions about a booking or the ships of the Disney fleet? Call Dreamlines cruise experts on 1-888-403-1425 and you will be advised with passion!